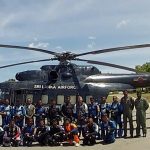 What a great experience while training with the Sri Lankan Air Force in Ampara, Sri Lanka. Thanks for the amazing hospitality. Special thanks to Wing Commander Jagath Godakanda and Squadron Leader Sampath Piyasundara for the great organization. We had a great time!